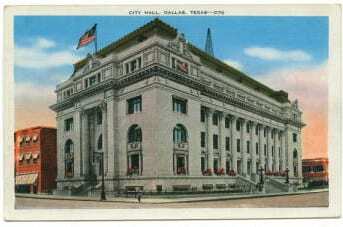 Dallas City Hall ca. 1910. DeGolyer Library, SMU. A high-quality version of this file may be obtained for a fee by contacting degolyer@smu.edu. Dallas City Hall ca. 1910. Courtesy DeGolyer Library Special Collections, Southern Methodist University. Used with permission. Just south of the Elks Arch.